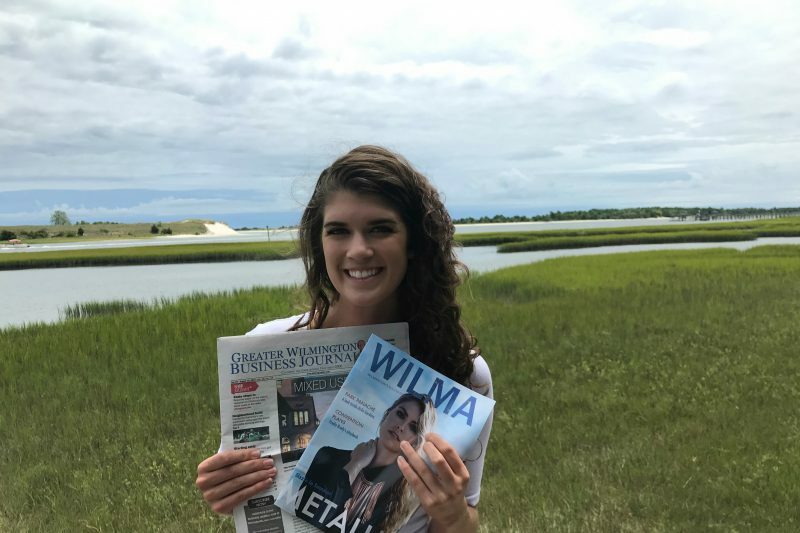 All Up In Wilmington’s Business Elly Cosgrove '19 stayed busy this summer with internships at the Greater Wilmington Business Journal and WECT (Channel 6). Elly Cosgrove ’19 holds up issues of the Greater Wilmington Business Journal and WILMA Magazine, where she was a summer intern. I had two internships in my hometown of Wilmington, North Carolina. One was at the Greater Wilmington Business Journal and the other was at WECT News Channel 6. I received a Reynold’s Scholarship to help pay for these opportunities. Tell us a little bit about those organizations. Greater Wilmington Business Journal has a strong online presence and a biweekly print newspaper. Online articles come out daily. It also has an email subscription and sends out a daily newsletter along with breaking news alerts via email. WECT (Channel 6) is one of the local TV stations serving Wilmington and the surrounding areas. The station is a Raycom media station and is also an NBC and Fox affiliate. Along with the regular WECT local news, Fox Wilmington is also produced in at the station. Tell us a bit more about your jobs there. At the Greater Wilmington Business Journal, I wrote articles for both the business journal and WILMA Magazine (a women’s magazine that is published in the same offices). I wrote many articles on various different topics such as the local arts economy, business profiles, trends and achievers, and accolades. I also received some practice posting to different social media platforms (predominately Facebook). I wrote web blurbs for our newsletters and other short articles such as spotlights, restaurant round-ups and achievers. At WECT, I shadowed reporters and practiced shooting footage with them while they were in the field. I learned a lot about video and how to look for the best shots. In fact, this experience made me more confident in my ability to operate a heavy-duty camera and how to take quality shots. After being in the field with reporters, I would go back to the station and create my own package. I wrote my script, edited my own video and recorded my own voice over. It was a great experience because I got to see what the turnover is like in broadcast news. It is a very fast-paced environment! The reporters — and sometimes even the anchors — would always read my scripts or watch my packages for me and give me helpful feedback. I even had the opportunity to go out into the field for breaking news. Some of my footage even made it into the breaking news story. My favorite story that I worked on for the Greater Wilmington Business Journal was one about a McDonald’s franchisee who owns 15 McDonald’s locations in the Wilmington area. His company is called McAnderson’s Inc. and he has been a franchisee since 1974, so he has seen so much change over the years. I really enjoyed speaking with Mr. Anderson and having the opportunity to tell his unique story. He is quite the businessman and has impacted so many lives in the Wilmington community through the amount of jobs his company provides. He creates a great working environment for his employees and loves to serve his costumers. I really enjoyed writing about such a passionate person. I mentioned this earlier, but my favorite story for WECT was the breaking news story I was able to help cover. I went out into the field with a news reporter and we got a tip about a huge fire in the area. It turned out the tip was legit, and we were on the scene of a huge structure fire before the first respondents had even arrived! The reporter I was with had to act quick in order to get shots of the fire, so she had me take videos with a phone while she got footage with her camera. I sent all my phone videos into the newsroom and the raw video was actually included in the breaking news online article. It was such an adrenaline rush. I also helped track down witnesses for the reporter I was with so she could keep getting her B-roll. She later interviewed this witnesses. No one was injured in the fire, thank goodness, as it was a vacant building. It was such an adrenaline rush and time absolutely flew while we were covering this story. Honestly, everyone I met made such an impression on me. I grew up in Wilmington and lived in the area for 18 years. However, both the experiences allowed me to meet such important and interesting people in the Wilmington community that only increased my appreciation for my hometown. At the Greater Wilmington Business Journal, Dennis Anderson, the McDonald’s franchisee, made the most vivid impression on me. He was just so passionate and was in the business for more than 40 years. I really enjoyed my time speaking with him. I also loved my mentor at the Greater Wilmington Business Journal. She was the editor for both the business journal and WILMA magazine and she guided me throughout the entire summer. If I had interned at a larger business journal, I probably would not have had the same experience. My mentor, Vicky Janowski, went over my articles with me line-by-line. It was incredible, and I received great feedback. I don’t know how many interns can say that they got to meet with the editor every single day to go over their articles. She helped improve my writing so much over the course of the summer and also helped me find my voice as a reporter. I had incredible mentors at WECT, as well. My intern coordinator, Jon Evans, is also one of the anchors. He was incredibly encouraging and really helped me with my voice. I know that sounds funny, but my voice overs improved so much over the summer because he coached me on how to have a broadcast voice. Also, the reporters I shadowed were always so willing to help. They would always read over my scripts and give advice where they could. I learned how to write for the ear and write in a way that catches people’s attention because of these mentors. I felt most challenged when I needed to take initiative and ask for things to do. I was always looking for new opportunities, but asking to take on more responsibility was pretty intimidating at first. However, I got over this intimidation and grew as a person because of these experiences. I felt more comfortable asking for things to do and ways to get more experience. Wilmington is a BEAUTIFUL place (I might be a little biased considering it’s my home). It’s right on the coast of North Carolina and the beaches there are wonderful. I also loved being able to go home and spend time with my family. I entered the summer convinced that I wanted to do broadcast. However, by the end of the summer I’m really not so sure anymore! I loved my print experience and enjoyed the process behind each article. I still would love to do anything sports-related and hope that I can get some experience at a sports publication next summer. Journalism 201 helped prepare me for the business journal opportunity. However, I still have not taken beat reporting and I feel like that would have helped me so much for the WECT internship. W&L has also made me a more confident individual in general, and I think this confidence translated well into my internships.